In the midst of engagement season and with the cold weather outside, many of us are dreaming about a destination wedding. Fox World Travel can take the stress out of wedding planning by helping you to work out every little detail, even the party favors. Since party favors are a favorite among many guests, continue with the beach theme to give your guests something that they will remember! This list highlights our favorite party favors for destination weddings. Fox World Travel is excited to announce the expansion of their destination wedding services to offer more focused and individualized services to their clients. Their new Destination Wedding Department will provide couples with the ultimate wedding experiences in destinations throughout the world, the most popular of which are Mexico, the Caribbean and Hawaii. Services include destination and travel consultation, rate negotiations, coordination of guest reservations, group management, online booking capabilities, and creative design. Fox World Travel’s new department consists of Betsy Stark, Destination Wedding Supervisor, and Andrea Pradarelli and Erin Stair, the team’s Destination Wedding Travel Specialists. Andrea and Erin will consult with wedding couples and their guests to recommend travel options and coordinate details. Sue Lautenschlager and Emily Cook will provide operational and administrative support to the team. Why Have a Destination Wedding? 1. You’ve always imagined your nuptials in a certain vacation spot. Maybe you spent an idyllic vacation earlier in your relationship at a gorgeous Caribbean resort or a laid-back Key West hotel. Or maybe one of you spent summer holidays at a quaint New England inn or a rustic Montana ranch. If it’s easy to graft a picture of yourselves in wedding duds onto those wonderful holiday memories, a destination wedding may be just the ticket for you. 2. Your families and friends are from here, there and everywhere. 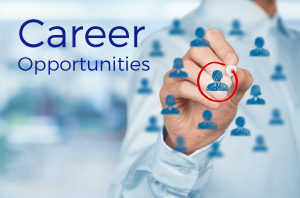 Many couples with far-flung families have thrown up their hands in despair at trying to find a spot that suits everyone. Soon it occurs to them: If everyone’s going to have to travel anyway…Voilà, destination wedding. 3. You’re not into traditional hotel/reception hall weddings. You’ve been there, done that (you know who you are – you’ve attended a wedding approximately 40 out of the last 52 weekends). All of these kinds of options are leaving you cold. But someplace warm? Ah, now that’s a different story. 4. You want to make the planning easier (yes, easier). It’s true that any wedding – whether at home or away – can morph into a logistical nightmare. This is where a Destination Wedding Specialist can do you wonders for you. We have specialists who are experts at planning destination weddings and take the hassle out of planning! 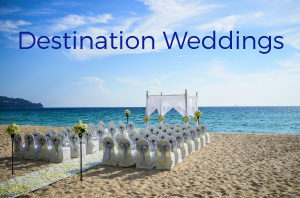 We also work with many resorts and hotels that have on-site wedding coordinators that do all the legwork in the destination for you, a destination wedding can be less stressful to plan with the help of a Destination Wedding Specialist! 5. You want to streamline costs (or even, in some cases, save money). No one can definitively say that a destination wedding costs less than an at-home reception. But no one can say it costs more, either. However, it often turns out to be easier to keep costs in check in a faraway locale. Two reasons: One, you’re likely to have a smaller guest list (the biggest way to save $$ on your wedding is to keep the list lean); and two, your choices are less copious than they might be at home. When you’re planning from afar, it all seems exotic and wonderful, so you’re more likely to be happy with the simple clutch of local flowers the hotel provides, whereas at home you’d be visiting a half-dozen florists and being tempted by a more lavish (and pricey) bouquet. Destination Wedding travel is very exciting! The destination wedding planners at Fox World Travel have years of experience specializing in all-inclusive destination wedding packages and more. All-Inclusive beach weddings are especially popular right now in destinations like Mexico and the Caribbean. In addition to All-Inclusive weddings, we can plan packages to Hawaii, Las Vegas, Europe and beyond. Group travel can be complicated, but when you work with Fox World Travel we make planning a destination wedding as hassle-free as it gets! 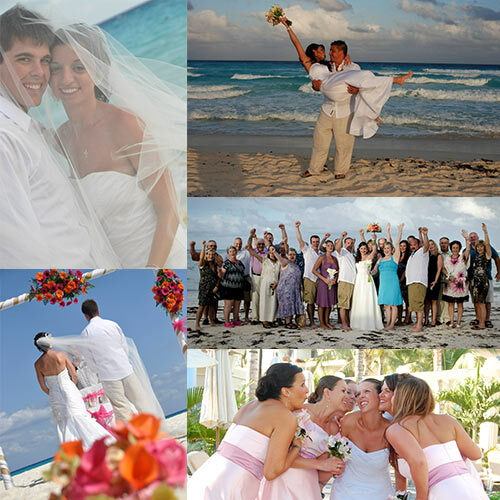 View a few of our destination wedding testimonials from brides and grooms we’ve worked with in the past. Many couples are now combining their wedding and honeymoon to create the perfect destination wedding. The many advantages this flexible wedding style has made it a growing trend with a lot of appeal. It is also a popular option for couples who want something a little less traditional for the second wedding or for vow renewals. Find a Destination Wedding Specialist today! You can say “I Do” anywhere! A destination wedding is considered at least 100 miles from where the bride lives. It’s easier. A Fox World Travel Destination Wedding Specialist will take care of all the hassle of planning and leave you to enjoy your dream wedding. You can save money on everything from a smaller guest list to the décor. The white sand beaches, snow-topped mountains, or the Eiffel Tower make for beautiful backdrops in your photos! Many resorts offer complimentary or affordable all-inclusive destination wedding packages, and, by choosing an all-inclusive resort, the cost of food, beverages and lodging will be included in the guests’ vacation packages. In addition, extending your time in the destination will cost you far less than taking an entirely separate honeymoon. Enjoy quality time with your loved ones and guests. You’ll have more time to enjoy together as well as with your friends and family during a week in paradise, versus a few hours at a traditional wedding reception. Relax together, eat together, dance together…all without feeling like you have to jam pack talking to everyone in one day. You can start the honeymoon early! A destination wedding is an easy two-in-one. Enjoy your special day and then sit back and relax as newlyweds. Our destination wedding specialists would love to help you plan your fairytale wedding! Your honeymoon is a time to celebrate a new phase of life together. It should reflect the special interests you share as a couple. This list is just a snapshot of the many honeymoon destinations around the world. 1. 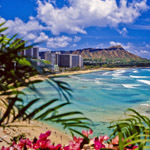 Hawaii Honeymoon – Dramatic coastlines, volcanoes, green forests, native Hawaiian culture, tropical breezes, white sand beaches, spectacular resorts. This is the magic that brings couples to Hawaii for the best in honeymoon getaways. 2. 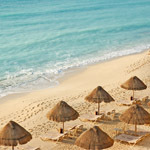 Mexico Honeymoon – A vast country with enough variety to please all. Bask in the sun at posh resorts along the Baja coast in Puerto Vallarta, Ixtapa or Los Cabos, or take in the beauty of white sand beaches on the Yucatan Peninsula in hot spots like Cancun/Riviera Maya and Cozumel. 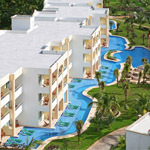 All-Inclusive resorts are abundant in throughout Mexico. 3. Jamaica Honeymoon – Passion is inevitable on this tropical paradise island. Jamaica is the place if you are looking for non-stop nightlife. If the bar scene isn’t for you, stay in one of Jamaica’s all-inclusive adults-only resorts. If you are a nature lover, take a leisurely bamboo raft trip or explore the many caves and waterfalls that abound in its green forests. 4. Italy Honeymoon – Italy is one of the top picks for Europe honeymoon locations. No wonder, it’s the land of Amore! From the Northern Alps and lake country to Rome and the Almalfi Coast, Italy has everything for a romantic and classy honeymoon. 5. St. Lucia Honeymoon – A bit of France, a bit of Britain, and a nature-lovers paradise including a volcano. Great snorkeling in clear, blue warm waters. Sip a cool tropical drink in your hammock. Walk through a rain forest while viewing the ocean. Truly a newlywed’s paradise. 6. Dominican Republic Honeymoon – The Dominican Republic has become a beautiful, affordable island destination. 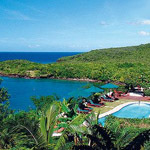 Being a larger island, that doesn’t just focus on tourism, you can get some great deals. There are many all-inclusives that will meet the needs of most couples. 7. Tahiti Honeymoon – How do you describe paradise? Many call it Tahiti! 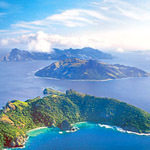 With many islands to choose from, including favorites Bora Bora and Moorea. From its natural beauty to its Polynesian hospitality. If you do not want to share your new spouse with anyone, this is the place to be. Even its resorts are designed for your love to burn and grow. 8. Fiji Honeymoon – Fiji has it all if you are looking to fill that image of white powder beaches with beautiful palm trees, green mountains sweeping to the sea, warm tropical breezes, and lots of secluded resorts scattered among its 300+ islands. 9. Spain Honeymoon – Spain is a location full of energy, but still with the laid-back Mediterranean style that any couple could love on their honeymoon. Fall in love with the art and gardens of Madrid, or bask in the Barcelona sun. From the sand to the sangrias, Spain is full of the timeless elegance that’s sure to make for a dreamy honeymoon getaway. 10. 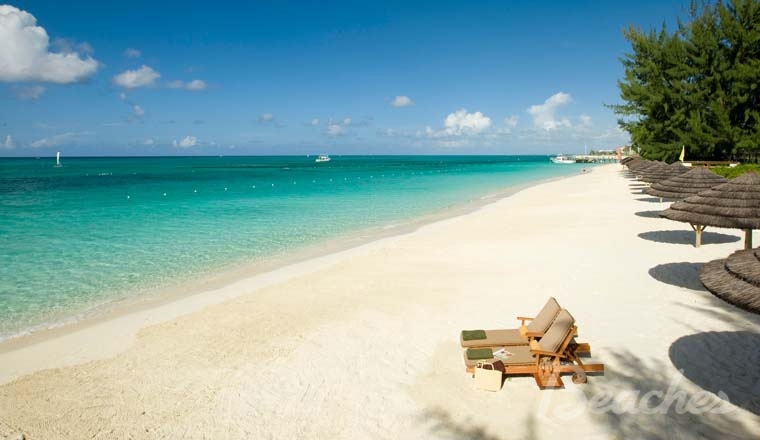 Turks and Caicos Islands Honeymoon – Turks and Caicos is the perfect romantic getaway for couples looking for exclusivity and seclusion. 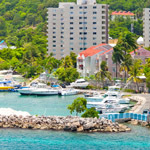 It is less developed and more upscale than many other spots in the Caribbean. Made up of forty islands, eight of which are inhabited gives the islands an intimate feel. Activities for couples are limitless, from snorkeling and scuba diving to bird watching and horseback riding. Be sure to see the sunset over Grace Bay, famous for the elusive “green flash” at sunset. This split-second burst of emerald light sometimes happens along the horizon on a clear day and is sure to make an unforgettable honeymoon experience. For even more honeymoon destinations, click here. Travel Specialist Katie Tappa from our Green Bay office, recently traveled to the beautiful Cozumel, Mexico. Katie is excited to share her first experience to the island! Having already travelled the mainland of Mexico several times, I was beyond excited for my FIRST visit to the island of Cozumel! Cozumel, the largest of Mexican islands, is located just off the coast of the Yucatan peninsula. For visitors staying in Cancun and Riviera Maya, it is a great snorkelling and shopping destination located just a 45 minute ferry ride away. Cozumel is also a very popular cruise port, with two different piers on the island. With nonstop, charter flights running from Milwaukee and Chicago direct to the Cozumel airport – I couldn’t wait to spend seven whole nights exploring this unique destination. In my adventures, I found Cozumel to be incredibly tourist friendly, very safe, and even more beautiful than I imagined. The snorkeling, which is available right off of the beach at many resorts and also through official tours and excursions, was amazing! I was able to see sea turtles, sting rays, rock fish, and more tropical fish than I could name! Cab rides into town were fairly inexpensive, allowing the opportunity to go out and experience all that the downtown area of Cozumel has to offer. The food was some of best I’ve encountered – freshly caught seafood and authentic Mexican dishes were widely available and are not to be missed! And of course, no visit to paradise is complete without “wasting away again at Margaritaville”! It may be a “tourist trap” but it’s just too fun to skip – and the calamari was delish! I fell head over heels for this beautiful little island and can’t wait to return. With plenty of All-Inclusive Resorts to choose from and seasonal direct flights running from the Midwest – I would recommend this budget friendly destination to anyone looking for an island getaway. If you are interested in taking your next vacation to Mexico, contact me and I would love to help plan your next adventure! WOW is all we can see about these amazing sunset photos taken during one of our client’s destination weddings in Puerto Vallarta!! Sarah and Nick, along with their family and friends traveled to Dreams Villamagna in Puerto Vallarta, Mexico for a dreamy destination wedding. It truly was a beautiful setting helping to create a fairy tale wedding for the couple and their family and friends. Sarah Timmers, one of our destination wedding travel specialists helped in planning their special week! If you or someone you know would like assistance with your destination wedding, you can reach Sarah online here! Destination Weddings Available – No Passport Required! These days beautiful and exotic destination weddings are all the rage. With so many great options in Mexico and the Caribbean – it’s easy to forget that the U.S. can provide many of the same great services and gorgeous landscapes for wedding photographs. Katie Tappa, a travel agent in Green Bay, WI recently welcomed home a wedding group from Fort Myers, Florida. The group of approximately 30 guests celebrated this very special occasion at the Pink Shell Beach Resort and Marina. One guest said it perfectly, “The ceremony and reception were absolutely beautiful and very classy. Their tabletop décor was beautiful. Musician was excellent. Food was very good.” The group raved about the service as well…“They were attentive and friendly – Many of them work an entire day from breakfast to close, and with smiles on their faces.” We want to thank Mr. and Mrs. Ritter for choosing us to help plan with this important day! We want to help you plan YOUR destination wedding! 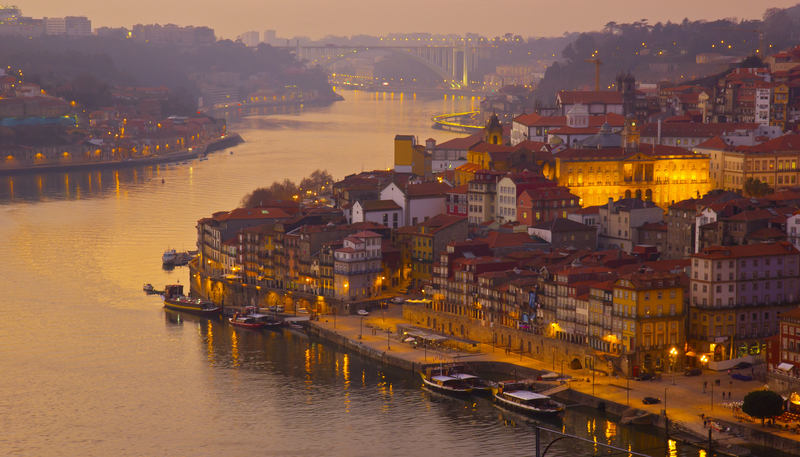 For ideas on domestic or international options, contact Katie Tappa or any of our Vacation Travel Specialists!